So I'm trying to build something in VR. Basically it comes down to creating a thing that can walk around as if the two hand controllers were feet, supporting a head. I've tried several approaches, the latest one is to have two "bones" that are scaled to their distance from the headset, and joined where the head would be, and copies the rotation too. Which actually works! Except one problem - it reacts as expected to gravity, which is great. It falls and is on things. If I move the "arms" around, it even jumps. Which is a thing I had trouble with with a previous approach. But the problem is because it is all done via setting rotation and scaling, it doesn't "walk", or there's no grip - that is, the points that are in contact with the environment glides around. So I added more rigidbodies as "feert" and connected it up to the legs via fixed joints. And it mostly does work as intended, except when scaling the bones, the joint that connects the feet to the bones doesn't move with the bones. I haven't found a way yet to move the connecting point of a joint without freaking physics out. 1) How to set all the stuff with pure physics without it freaking everything out (I have tried to set the rotation with PID controller type stuff, which seems to freak out because physics is hard)? 2) How to scale and move attached joints without freaking everything out? 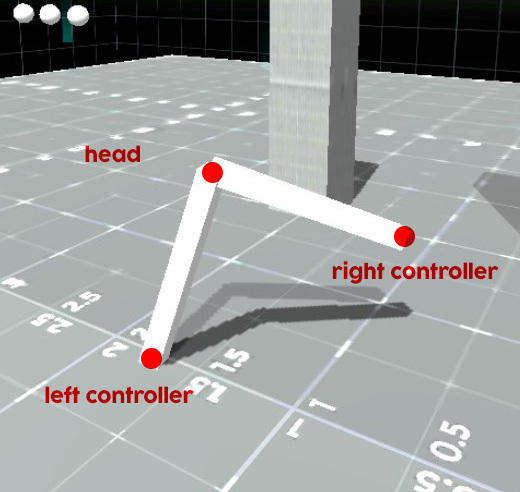 Like, I just want a thing that lets me walk with physics, tied to the position of hands and head in VR. How hard can this be?!?!?? It worked quite well for my project which involved plants constantly growing and having physics-based interactions with the environment and player.